Animal Man watches with embarrassment as B'wana Beast yells out his battle cry fighting Gorilla Grodd's army of mind controlled apes with Superman and Dr. Light. It isn't that they hate him it's the fact he fights solo and makes an aggressive "I am the King" speech in every battle. Worse for Animal Man, it seems that because their powers are animal kingdom based they are always teamed up together. 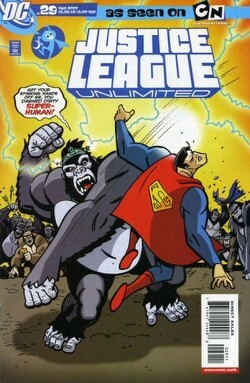 Despite B'wana's grandstanding, the rest of the JLU take out the apes. Still Superman, leader of the strike team confronts B'wana and the two almost come to blows. This is another thing that Animal Man hates... being grouped with a hothead means he often has to act as a mediator. Back on the Satellite Superman asks Animal Man to help B'wana understand that JLU is about being a TEAM. Naturally B'wana doesn't take too kindly to being told what to do but despite their intervention failing Superman asks Animal Man to keep trying. Mr. Terrific interrupts them with an emergency. Queen Bee has turned Downtown into a giant bee colony and it's up to Superman, Animal Man, Fire, and Booster Gold to stop her. B'wana volunteers for the strike team. Much to Superman's distress. Animal Man stands up for his 'partner' and B'wana is allowed to join them. They arrive and are immediately drawn into battle. Each use their powers to great effect and it looks like the tide may turn in their favour - until Superman is taken out by miniature mutant bees invading his ear canal. Suddenly, Fire's smoke doesn't work, Booster can't out fly them and B'wana is being repeatedly stung. Animal Man is able to get close to Queen Bee but as he's about to take her out, he is ambushed by larger bees. B'wana abandons his 'king of all beasts' attitude to rescue his team mate. Animal Man tries various animal personas to fend off the bees and their leader; all failing, until he takes B'wana's lead at being a team player. Taking on the persona of a bee and attacking the Queen suddenly makes ALL the bee's resolve to attack their controller. With team work they finally succeed and save the day. Despite all he's learned about being a team mate B'wana is still too hot-headed to admit he's equal to the others. Even though they know he'll never drop the act Superman and Animal Man are just happy he's finally learned to be in the JLU as team player! Story - 5: I've always hated Vixen, and her male counterpart is a much more fun, interesting character so it was cool he shared the spotlight with Superman and B'wana Beast. I am guessing Queen Bee made an appearance due to her role in the JLH video game and I'm pleased that's the case because previous to that I'd never heard of her. I had once thought this title was ripe for the executioner's block but the more I've stuck with the title the more I am enjoying it! Art - 5: I think this title has grown in strength in the art deparment with each passing issue. I love the fact that there is plenty of cameo character interacting and the detail they receive. Long may it continue! Cover Art - 4: Superman on the cover! Killer apes on the cover! Cool beans! Superman doesn't usually grace the cover and though he's taking a beating this issue it still ups the grabability factor of the book! NICE!